Indonesia, March 2017 - Indonesia has become a competitive market offering a wide variety of hotel styles, star classes, and brands. From local to international chains, everyone is jockeying for a piece of the business online and offline. Traditional offline agents are a large part of business in the country where many still prefer the one on one level of support they get from travel agents planning their holiday or business travel. One of the most well-known wholesalers in the region, MG, recently spoke about the trends they have seen in 2016 and their predictions for 2017 in the hospitality sector. MG Group CEO, William Newley said "We have been thrilled with the tremendous growth in room nights booked from travel agents through our various distribution channels. As travel experts, our agents need to be quick to make shifts and offers to their clients and we've found a sweet spot in that field. Technological advances in bookings, rates, revenue management and various other avenues have helped us to stay on top of the curve." In 2016, the group noticed one large noticeable change in business. There was a dramatic shift in preference where agents were now booking one hotel group significantly more than any other in the country. William explained, "It has been exciting to see such an explosive growth in the bookings for Archipelago International hotels. We've always had a strong partnership, and usually, predict they will be a leader in Indonesia for bookings, but this trend is a lot more than the expected share. It shows a clear preference to the group on a variety of locations, brands and price levels." 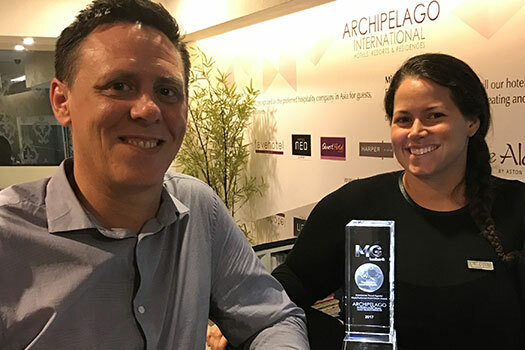 MG BedBank and their partners decided to recognize this achievement by awarding Archipelago International as "Indonesian Travel Agents Most Preferred Hotel Chain". Vice President of Sales and Marketing for Archipelago International, Tenaiya Brookfield, was delighted, saying, “We are so incredibly honored to receive this one of a kind award from such a large prestigious group. We strive to be flexible in working with client's needs, action-oriented when it comes to creating solutions, and above all work with absolute respect to our trade in the hospitality industry. It’s a rewarding affirmation to hear our clients say that they appreciate and fully support us." Forgoing an elaborate awards ceremony, the two groups met to reflect on the first quarter of the year and went straight back to work planning strategies for the rest of the year. They took a few photos at Archipelago International's corporate office in Jakarta as William handed Tenaiya the stunning crystal award. When asked what were the top 10 most popular cities/hotels being booked they mentioned Aston Anyer, Aston Sentul, favehotel Braga, Aston Marina, NEO Melawai, The Grove Suites, Grand Aston Yogya, Quest Surabaya, favehotel Balikpapan, and Harper Kuta.